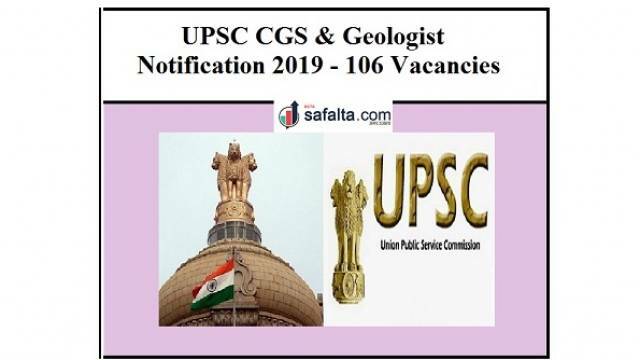 Union Public Service Commission has released the notification for the recruitment of 106 posts.UPSC Recruitment 2019 will be conducted for Combined Geo-Scientist and Geologist Exam 2019. Interested candidates should apply online through the prescribed format. Applicants should check the complete advertisement notification such as selection process, application fee, important date, details of posts and so on. Aspirants should visit the official website and download the notification to know more details. Candidates should have Complete Master Degree Geological Science/ Geology/ Applied Geology/ Geo-Exploration/ equivalent) & M.Sc. (Physics/Applied Physics/ Geophysics) or M.Sc. (Tech.) (Applied Geophysics) for Geophysicist Post, M.Sc (Chemistry/ Applied Chemistry/ Analytical Chemistry) for Chemist Post, Master degree (Geology/ Applied Geology/ Marine Geology/ Hydrogeology) for Junior Hydro-geologist (Scientist B).